Today, drone pilots can begin logging their flights with Airnest, a simple, free cloud-based logbook platform. 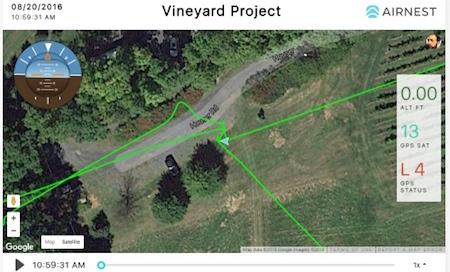 It makes it easy to share with other drone enthusiasts, including a handy GPS-based map showing the flight of the drone. Pilots can sync flights automatically when using the Airnest app or upload logs from other services such as DroneDeploy. Soon, Airnest will offer the ability to upload logs from DJI GO and other providers. “It’s amazing to see your own flight data presented in such a simple, understandable way – diagnosing potential problems is going to be much easier,” Justin Miller, filmmaker and co-founder of Airnest, said. While competitors in the market have similar offerings, Airnest is the only platform that offers an app for drone control and flight planning. It’s also the first to offer a simple way to share flights. The Airnest app is now available for free on the Apple App Store.